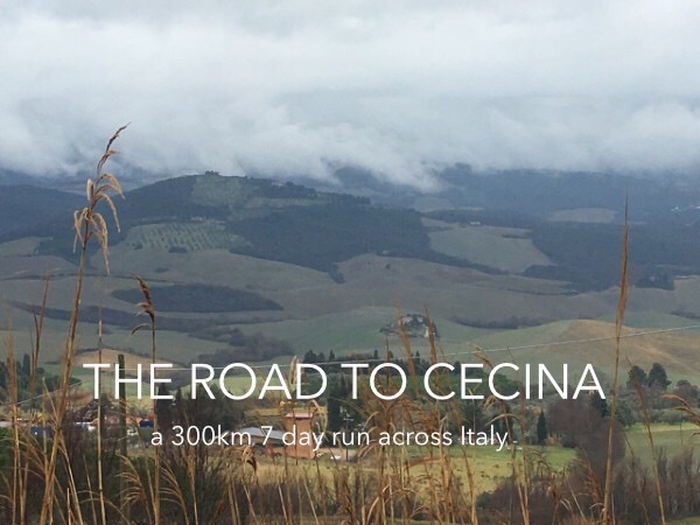 The road to Cecina – So I had got to Day 7 and what should be my last day on my epic run across Italy. 260km and some 19,000 feet in the bag and just 40km to go; and what’s more I had been promised it was downhill all the way and the sun might even come out too. I trotted through the cobbled streets of Volterra towards the town’s medieval battlements and the road to Cecina. I picked up the narrow road and descended the hill that the town was perched on towards the plains that would take me towards the sea. As I got into a rhythm, the steady pitter patter singing to me on the road, I started reflecting on the journey and what it had meant to me. It was very different from my Pyrenean odyssey – obviously the distance wasn’t as far, some 300 miles less, but it had been squeezed into a week and I had been amazed at the amount of ascent, 20,000 ft. I had been running in the Pyrenees in temperatures of 30c+ whereas here I had been lucky if the temperature got much above 5c and of course there was the rain …. But there were similarities too – the people had been so friendly and welcoming and the scenery just stunning and yes, I was permanently hungry! I hadn’t been nearly as fit heading into this one with a series of niggling injuries, general lack of oomph and a streaming cold. But my body had held up well and, as is so often the case with me, I had got stronger as the journey wore on. Anyway back to the business in hand; I knew that the final day was often a challenge, your guard relaxed as the finish line drew near. With that, as if to emphasise the point, I was startled with the sound of a loud horn as a car brushed past me – I had strayed into the middle of the road and however quiet it was I remembered I wasn’t the only road user. I was glad to find a track that took me off the road and towards the town of Saline. I skipped past deserted buildings, tired farms with patchwork roofs and barking dogs as I inched ever closer to the sea. I stopped for a pit stop (2 double expressos) in Saline which was a sprawling, run-down town that had sprung up as a result of the salt mines. I was back on the road and making good time but by now the traffic was getting heavier and the road windier although there was a reasonable gutter on the side which was my escape route in case of emergency. The traffic problem was negated when I found a pedestrian walkway which ran along the side of the road for about 3km and by the looks of it had never been used – viva the EEC and their budgets. The relief from the traffic was all to brief as soon I was back on the road dodging the lorries and cars, most of whom gave me a wide berth. But of course there were one or two who took delight in driving right at me and then swerving at the last minute. Never mind, my spirits were lifted as I started to see signs for Cecina although this was tempered somewhat as this final leg was going to be a lot more than the 39km I had estimated. Another pit stop and decision time; I could continue on the main road or there was a much smaller road that ran alongside, that would take me the whole way to Cecina although it would be a few km longer. I was tired and had had enough of the traffic so the decision was made and it was with a glad heart that I turned off the main road down a small, single track road that headed out of the town and into the country. I crossed a river and started to head up a hill – that wasn’t on the agenda.But I didn’t have time to complain for too long as a peloton of professional cyclists, on a training run, swished past me leaving me in their wake. Up and up I climbed as my progress slowed to a crawl but I was spurred on by the afternoon sun and the thought too, that I had just a few hours until sunset and no head torch which was sitting on my bed in the UK waiting to be packed. At last I started the long descent into Cecina and the finish line but the only race now was with the fading light as the sun slowly started to dip towards the horizon. 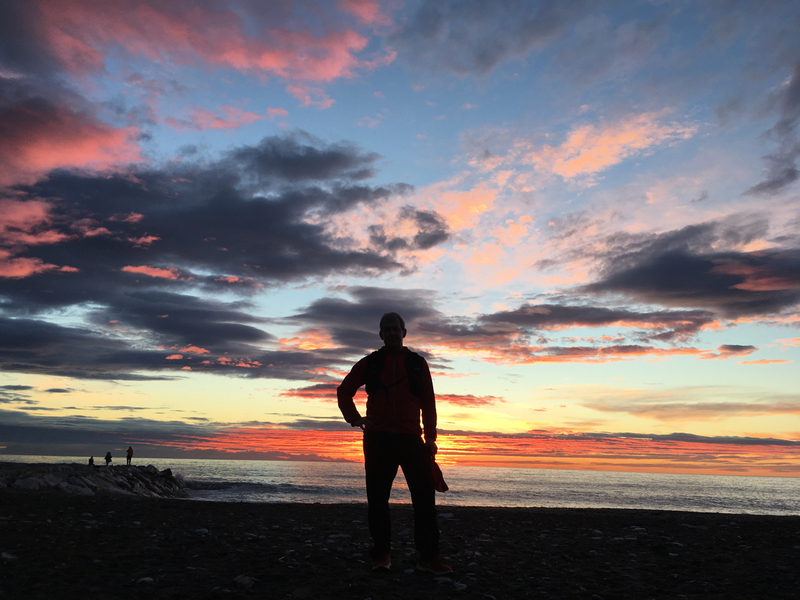 I was flying through the outskirts of Cecina, running as fast as I had all trip desperately trying to find the marina and the sea before the sunset. A sign – “Marina di Cecina 2km”. 2km might not sound a lot but with 300km behind me and aching legs it was not what I needed but I ran faster and faster chasing the sun and with tears streaming down my cheeks and a huge grin on my face arrived at the sea front. I thrust my phone into a startled couple’s hands and asked them to take the obligatory end of tour shot. Inspiring as always – look forward to the book. Hope you bought your bike today! Thanks Mike – nearly ready to pull the trigger on the bike. Great advice!